Here's my beautiful barn owl! I love owls, and was so excited to make this little guy. I read the book Guardians of Ga'hoole and then watched the movie, and then when I learned to crochet I couldn't help but make Soren and some of the other characters. This pattern could also be used to make a normal barn owl. This is where it gets tricky. Sew with thread or yarn. Before you finish the head/body, (putting the first st in the back) slst or embroidery (I used slst) the heart around his face using tan yarn. Then embroidery beak just above bottom middle of heart. Place black 8mm eyes in head a little above beak. Embroidery tan yarn around eyes. After all parts are made, sew wings onto sides of head/back/tail. Sew top of head/back/tail onto head/body. On top of head/back/tail, sew around to round 26, where tail starts. Sew across above round 26. Then sew legs on bottom of body. Soren the character belongs to Kathryn Lasky, but the pattern belongs to me. I was wondering where the directions are for the cream color on the insides of the wings? They're the same pattern as the tan wings. SK means skip; SLST means slip stitch; F/O means fasten off; FLO means front loops only; and BEG means beginning. It says; left wing, make one tan and grey and one cream! Also for right wing. Yes, you make one tan and one cream for each side. Then you sew the tan and the cream together. this is beautiful thank u for sharing! Great Barn Owl... Looks like Soren! Thank you so much for sharing such a wonderful pattern. Sorry! It should have said 18, not 12.
do i carry on doing FLO throughout the whole wing? or only the foundation chain? If by FB you mean FaceBook, then no I do not. But I am on Etsy. Thank you so very much for sharing such a wonderful pattern, he is magnificent. So #1 when it chains 6, 6 thats your first row for the ring, and then you add two stitches two make 12 for row two. Is that technically your first row of stitches? When I say 'ch 6 in ring' I mean you put (work) 6sc into the ring (aka-'magic ring'). If you do not know how to make a ring, then you could do ch3, then join to make ring, then sc 6 in ring. To sum it all up, you have to have a 6sc circle for the first row of stitches. Then you can move on to the next row. I'm not sure what you mean by FLO, I've never seen that instruction on a pattern before. This is absolutely adorable! I have 2 purposes to make them. My daughter LOVES owls, and I am a volunteer on the Owl Creek Reservoir Commission. We are restoring the reservoirs and taking bake nature. I am going to make a few to raffle off at our benefits. Never mind my previous comment, I had a brain glitch! lol. I know what FLO means. I can be such a dork at times! But I do love this pattern! Thank you for posting this pattern. They are amazing. This is my first crocheted animal and I'm having trouble with the top of head/back/tail piece. Rounds 1-2 are in the round and then rounds 3-4 say to ch 1 and turn, creating a notch. What is the purpose of this notch? From the pictures included, I can't see it. Basically, what I was doing with steps 3-4, was trying to make it look like the rest of his back and tail. Unfortunately, the only way I could do this was to do the ch 1, turn, which created a little notch. So I just sewed the notch shut so it looked like the other side of his head. Sorry about that! From one owl lover to another... There is a live streaming camera that features a great horned owl. Here is the link so you can watch! http://www.ustream.tv/okcowlcam Is there any chance you might come up with a pattern for a Great Horned Owl? Thank you! Great horned owls are so beautiful. I'm planning on making every type of owl eventually, and the great horned owl is close to the top of the list. I'm trying to get the wings to open and close, but I haven't figured out exactly how I want to do it, yet. I may make Bubo (a great horned owl from Guardians of Ga'hoole) in the meantime, though. Your work is amazing. Thank you for sharing and for being so generous! I'm going to try to do the barn owl pattern when I feel a little more confident! God bless you! Thank you so kindly. This amigurumi pattern is great and so are you for sharing it! Its pinned at http:///pinterest.com/butterflyfairy2 on -Plushies to Crochet- board. §§HI... HOW big would the owl be if I used a 6.5mm and 5.5mm hook size? THX! I'm not sure exactly how much, but it would defiantly be bigger. However, I wouldn’t recommend you use sizes that big unless you use thicker yarn- otherwise there will be big holes in between your sts. WELL OF COURSE my dear...you can make him as fat as you desire. Thanks! Actually, you can probably make Eglantine using this pattern. You could use a smaller sized hook and (not too thick) fluffy yarn. And yes, I did stuff the body. Good question though. I guess I thought it was obvious and forgot to put it in the pattern. Sorry! I've only been crocheting for a few years, and types of yarn aren’t my strength. However, there is a list of yarn sizes at Wikipedia. And if that doesn't help you, then I suggest you play around with sizes and see what you like. No, I really am the crocheter of this website. However, I wouldn't call myself a "professional" crocheter. I'm simply a young crocheter who would like to share her patterns with other crocheters. I hope your owl turns out nice! If you have any more questions, I'd love to help you in whatever way I can! About six and a half inches high. I'm having trouble with the heart on the face. I'm not sure I understand the directions - with the SLST in particular. How does that work? Maybe I'll just have to sew it, I just don't understand how the to get the slip stitch started. I understand how you got confused with the directions; I was new to crocheting when I wrote this, and do things a lot differently now. I was trying to explain how to do the ch st by using a crochet hook; but now I know it is much easier to do with a yarn needle. So I would suggest you just use the ch st with a yarn needle (if you haven't already). Row 19 does not make sense (sc in first 7sts, sk next st, sc in next 11 sts, sk next st, sc in last 2 sts) the last bit should be sc in last 7 sts? You're right. I'm missing 5st. Yes, I think the last part should be 7st instead of 2st. Thanks! What row do you start the heart shaped for the face. Hello, Shelly! Sorry it took so long for me to reply! Good question- I suggest you make the Head/Back/Tail piece as well as the Head/Body piece before you worry about the face. Then, once you've fit the Head/Back/Body piece onto the Head/Body (however you don't have to sew the Head/Back/Tail piece on first), determine where the face should be placed (it should be about 9st long and 9-10st wide). This seems a fantastic pattern - but I am having to write it down as the printed version was impossible to read due to the type colour. Would you like me to change the colors to black for a few days so you can print it, or are you already finished with it? Highlighting the text also works well, or copy and paste it into a plain text document. It is a little tough to read, but at the same time, I liked how I could tell what color to use by the text color. It was a very cute addition! On a darker background, with such light colors, it would work even better. cute thank you very much for this beautiful pattern, I love owls but I want to do the same but much larger, measuring about 30 cm. How do I can get the count of the number of points to make? I'm also a bit tricky since I speak Spanish and I have to translate some terms. but this really worth doing. This too cute. thank you very much! Hi! Since Soren is about 16cm, you want to almost double his size. So, I guess you could times everything by two (x2). This would be a bit tricky, but I think it would work. You could also use a bigger sized hook and thicker yarn, but I'm not sure how much bigger to make it the size you want. Good luck! Let me know if you have any more questions. I'm sorry, but I'm not sure exactly what you need help with. Maybe you could make one using my pattern first, and then see what you need to do to make it the size you want? Sorry I couldn't help you more! Fair is my maiden name!! I copied and pasted this page into Word -- and somehow there is a picture of Soren with full wing spread! How did that happen?? I saw the link on Pinterest. I came here and the owl is different. This one is cute but the other was beautiful. Do you have another pattern with the owl's wings outstretched? Yes, the pattern for my large, open winged barn owl is available to purchase from my Etsy shop (See top right of page: Mt Etsy Shop: GreatGreyCrochet). I am having trouble trying to figure out the owl's face, you have to keep jumping back a forth from page to page, is there anyway you can help me? the right side and left side are different shapes is this correct? Do you mean my Soren pattern or my open winged barn owl pattern? It sounds as if you are talking about the open winged barn owl. If so, would you please consider contacting me through Etsy? I will help you more once I know for sure which owl I am dealing with. I'm sorry you find it confusing. I understand you must be frustrated, but please do not give up! If you are still willing, I have a few suggestions for the face and am more than willing to help you through any other problems you may have. However, I understand if you do not want to work with this pattern and truly am sorry. Thank you for the suggestion, and if I ever update the pattern I will email it to you. I have two questions. One what is the length measurement of the owls wings? I want to use his to hold my curtains open. Two what does FLO mean I have never heard that term before. Each wing is about 4in long and 2in wide; and his body is about 6 1/2in long and 3in wide. FLO means that you crochet in the Front Loops Only. Love the owl pattern. Making it for my Mom who has the on set of Alzheimer's and loves owls. She is in a nursing home and thought I'd brighten up her day. I'm a somewhat beginner at crochet. Thanks so much for this pattern. Love the owl pattern. Making it for my Mom who has the onset of Alzheimer's and she loves owls. She is in a nursing home and I thought it would brighten up her day. I started crocheting a few years ago. Thanks so much for the pattern. Hello! I was curious about your pattern for the owl with open wings, my brother is making his babies room a Harry Potter theme and I thought it would be a great touch! However when I went to your etsy I saw the pattern was no longer up. Will you be reselling t in the future? Thank you! Hi! I took it off Etsy due to some complaints about the clarity of the pattern. I will put it back on once I have fixed a few things. Some have had problems with it and others have found it to be a good pattern. I just want to make sure I do everything I can to make sure that it's as easy to follow as possible. I'm sorry about the inconvenience! Hi. Im working on the owl. And I cant seem to find where you explaine the beak , making it and where it goes. Thanks for your help. Hello. I didn't really get into too much detail about the beak; but basically you embroider on the beak (using whatever method you would prefer) two rows below the eyes (depending on how big you did the heart) in the center of his face. The beak should be two stitches wide and one and a half to two stitches long. Sorry it took me so long to reply! Hope your owl turns out great! Thank you for this beautiful pattern. I use to volunteer at a wildlife rehab center. <My daughter and I started together. I no longer volunteer. She became president on the board. I will be using this patter for fundraisers if it is OK. It's a nonprofit organization. I live in Ca. They mostly rehab birds of prey. They have kept some unreleasable birds which they take to schools and other places to teach the public what to do if they find an injured bird and how they live in the wild. The name of the organization is W.E.R.C. which stands for Wildlife Education and Rehabilitation Center. Thank you again for the pattern. You're very welcome :) and of course you can use the pattern. Thank you for asking. So cute ! I love your beautiful pattern ! i am also new to crochet when you end the rows starting row 3 tan do you join? I'm sorry, but I'm not sure what you mean. Can you please be more specific as to where you're having problems? I was wondering, can I translate this pattern into dutch and share it with a group of people who make these kind of things to give away to childeren to just make them smile? Yes, of course you can! Thank you for asking. hi, i need your help!! what do you mean 'sk', for example 'sk next st'. thank you!! hi i need your help! what do you mean 'sk'? For example, 'sk next st'? Adorable! I know how to make basic stitches, chains, and doubles, and have made a horse hat of my own design(with help), but I don't know how to read patterns–I'm not sure what the abbreviations mean; I'm a beginner. Yeah, steps like 3 and 4 use to confuse me when I started crocheting. Basically you crochet ( to ) however many times it says, which in this case is "around". So in row 3, you take the (sc in next st, 2sc in next st) and continue doing that pattern until you run out of stitches at the end of the round. So you end up doing (sc in next st, 2sc in next st) six times, which gives you six more stitches than you had before (thus the 18). And you use the same method for row 4. I hope that helps! Let me know if you have anymore questions. If you have any issues with the pattern, or have others you would like checked, please email me: auntypoll@auntypollauzziecrochet.com. Thank you very much :) I'll let you know. do you have a shark slippers pattern? No, I do not. I'm sorry! Hi Karen! My opened wing barn owl pattern is available for purchase in my Etsy shop. 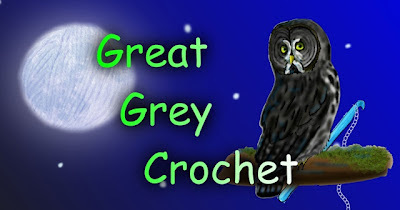 The link is at the top right hand side of this page under MY ETSY SHOP: Great Grey Crochet. Hello! Ok, when I say "down" (I would use the term "across" now) I just mean that you continue using sc in the remaining chs from the "ch 4". So you would end up with 3sc and that would form one toe. Than when I say "slst in same st" I'm referring to the st that you had previously slsted in. Sorry if that was confusing! I noticed that on the wings on row 2 it says St in next 7 sts but then it says you should have 6 sts. It should be 6 all the way. Thanks, I can't believe I missed that! Maybe someone has asked this before although I didn't see the question anywhere. But, when do you use the "E" hook? And, in the wings, you say FLO but you've started with a chain, so there's only one loop to work in anyhow. Am I supposed to work the whole wing in FLO? Good questions...I believe I had used the E hook to embroider the heart around his face although it is not completely necessary as you can simply use an embroidery needle instead. I am a self taught crocheter and had just begun crocheting when I wrote this pattern therefore I thought you needed to write either FLO or BLO when crocheting in chains. I apologize for the confusion. Haha :) The 2sc in row 6 marks the top middle of his face. Because we have 20st in row 24 it is correct. I actually slsted it on using an E hook, however I would advise using a yarn needle to embroider it on. It is called chainstitch. I crocheted him in continuous rounds. I was wondering if Soren is worked in continuous round or if you join at the end of the round. Thank you. More specifically the head and body part. 5-6 ch1 turn sc around 17.
does that mean only crochet 17 stiches? Correct. Then you just continue to work as indicated. Can I ask how long it will be before the open-wing owl pattern is available again, please ? Hello! I loved this owl pattern. I never had a minute's trouble with the pattern. Well, There is one thing I had trouble with and that was the legs...4 sc and 5 around was really hard to get them all in there and ss to join to make them round. The opening was small alos....Still love this pattern. I want to say I appreciate it, and thank so very much. thank you very much for sharing this wonderful pattern. First I must ask your pardon, I am German and I only have learned English at school. I hope you understand my question. I try to crochet the head/back cover. I do not understand, why you already turned in round 3 and 4. If I do that, the ring opens and than a I have difficulties in round 5 and 6, because round 5 ends with 17 stiches (7 unworked) and the opening is no more in the middle of the piece. If I close round 3 and 4 I do not understand why you already turn in these rounds. The first 4 rows are worked just like the Head/Body pattern. Then on the 5th row you crochet in the 17st and continue working back and forth instead of in rounds like the first 4 rows. What row do the eyes go in? I believe between the 8th and 9th rows. There should be 5st in between them. Gabriela, I'm Brazilian and I don't write in English very well. About your doubt, it's my doubt too. I think we should not close the magic ring. I haven't yet started doing the owl, but I'll try that. Since I used the magic ring I did not join. Hi, I have some questions as well. How big is the owl? What's the height of the final product? Can it be used as a hug friend? Hey! What is the hight of the final product? Wow this is a wonderfull Owl..!! Very nice, and thanks for sharing..!